The Phenomobile is the last precision tool developed by the Investissement for the future project PHENOME. 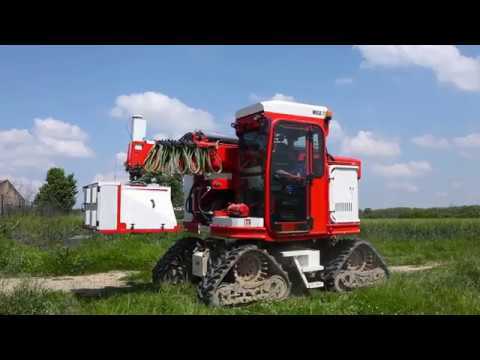 Based on the experimental large-scale culture unit of INRA Center Occitanie-Toulouse, this phenotypinh robot was built to characterise large-scale crops, such as wheat and sunflower, in the fileds. Thanks to its 9 sensors (visible and multispectral cameras and LIDAR), it observes micro-plots in different spectra and establishs a 3D profile of plants. It performs measures previously impossible several times a season, regardless of the weather thans to its powerful flashes. This unique tool in the world is already used in two research programs: Breedwheat on wheat and SUNRISE on sunflower for which it evaluates the beneficial effectis of the mixim of genetic diversity in cultivated varieties. Because of its short-term benefits for crop selection and crop characterisation, the Phenomobile allows French agriculture and research to be at the forefront, pioneering the development of varietirs adapted to future climatic constraints.